ANATOMY of a Plastic Girl (Chris & Cosey Remix) [Chris Carter & Cosey Fanni Tutti] by The Opiates. The long-awaited taster of Remixes and first single from the forthcoming album Hollywood Under the Knife. For The Opiates, these remixes by such greats as Hercules and Love Affair’s Kim Ann Foxman, as well as all-time heroes Chris and Cosey of Throbbing Gristle, are a dream come true. The Results are Magnetic. The XHK Mix with its hard Dubstep flavour completes the picture and gives the song a completely new voice and vibe. 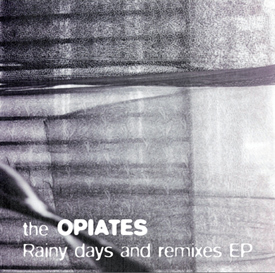 With the single ‘Rainy Days and Saturdays’, The Opiates live up to their ‘Carpenters of Electro’ title and hope to conquer airwaves and underground alike. The Opiates started with the intention of being an ambient project. Soon bored, they abandoned any genre restrictions in favour of music that inspired them in cerebral as well as booty shaking ways. The Opiates are Robert Solheim and Billie Ray Martin. Dubbed by the press as ‘The Carpenters of Electro’, their album Hollywood Under The Knife explores paths pioneered by the Chicago house and Detroit techno heroes, (not least Electribe 101), with the aim of taking things forward a step or two. Although Kraftwerk and Yazoo have been mentioned as influences, The Opiates’ unique brand of electronic music is not readily categorised. Theirs is a pursuit without compromise; a rare match of songwriting and cutting-edge beats and bleeps. Turner Prize winning artist Wolfgang Tillmans opened his entire archive and granted a free choice of images for The Opiates to choose from, resulting in nine previously unseen and unpublished images making up the artwork of the album cover and booklet. The Opiates will boldly go where the best electronic duo crossover albums have gone before, and will appeal to charts and underground alike. An EP entitled ‘Anatomy of a Plastic Girl’ was released in March 2008, accompanied by a much celebrated gig at London’s Rough Trade store, resulting in rave press reviews for both the gig and the EP. In Germany, the song ‘Anatomy of a Plastic Girl’ made it into the Top 20 listeners choice charts when added to the playlist at Radio One. Plans are afoot to stage a performance/play entitled ‘Anatomy of a Plastic Girl’, a multimedia piece using Wolfgang’s images as well as multimedia elements, in the near future.